These days it can be difficult to find the real handmade Venetian products buried under all the chotsky imported into Venice from abroad. Yet, Venice is inhabited by many of the world's great artisans - glass sculptors, metallurgists, cobblers, clothing designers - and a piece from one of their shops will truly become your souvenir to last a lifetime. Not to mention that the artisans of Venice are wonderful characters! Seeing them at work will enhance your experience of the City. 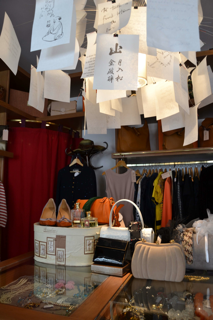 Most of the shops included in this section of OG Venice are locally owned designer shops wherein the items for sale are designed and produced in Venice and the Veneto. 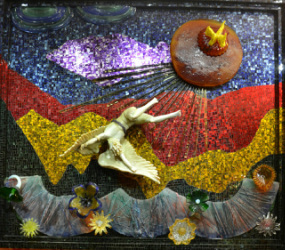 Many of these artisans also use locally produced materials such as Murano glass. You'll be blown away by some of these designers use of traditional materials in their surprisingly contemporary designs. Venice is a city bursting at the seams with art, from the ancient to the contemporary. 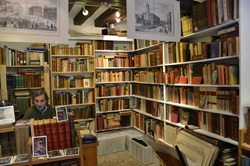 The shops included here sell fine art, sculpture, paintings and prints as well as antique books. 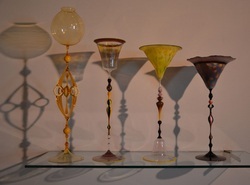 Murano glass is the most famous, historic and important art of Venice. Authentic pieces, produced by the glass masters of Murano, are unique, handmade and contemporary pieces of functional sculpture. No one else will have anything like it and no two are exactly alike! Each bead, or "perle", of a Murano glass necklace is hand-blown by a Murano glass master. And each piece of jewelry is individually designed and hand assembled. 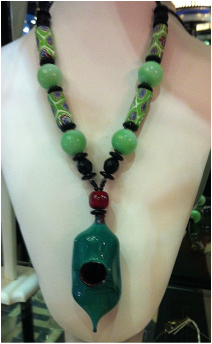 How can you tell a real Venetian glass necklace from an imitation piece? Easy. They are all unique and look nothing like your grandmother's mille fiore. Dig deep enough and you'll discover that the side streets of Venice are inhabited by all manner of obscure geniuses deeply committed to their crafts. 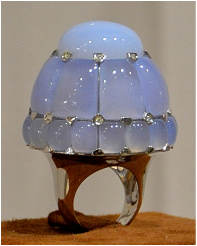 You don't just find a goldsmith here, you find certified and published metallurgists creating contemporary pieces using the ancient methods of Italian sword-smiths. Ah the coveted Italian Leather handbag! Yes, you can find them in Venice. Every major Italian fashion house has a flagship in Venice. You can find most of them on Calle XXII Marzo. 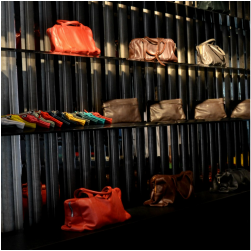 Here I will introduce a few emerging brand handmade Venetian and Italian Handbag shops. Italian style never goes out of style. However, the 1960's are over in the contemporary boutiques in Venice. 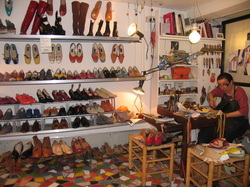 These shops offer handmade original clothing shoes and accessories that are decidedly now. What memento to remind you of your time in Venice? What treasure to bring home for family a friends? Make them truly special handmade souvenirs from one of these outstanding, Venetian-owned artisan shops! Vintage shops in Venice Italy?! Yes! Though many of them are such well kept secrets that most Venetians don't even know they exist, the vintage boutiques of Venice have gained quite a following in recent years.